(Free bottle will not show up in cart, but you will receive 7 bottles when you purchase 6. This offer is applied to multiples of 6. If you order 12 bottles, you will receive 2 more free). Adjust hyperlipidemia, high cholesterol, keep blood vessel elastic, prevent arteriosclerosis, cerebrovasculariasis, cardiovasculariasis. Indications include: High cholesterol, obesity, stress, high blood pressure, diabetes, for those who drink, smoke, eat fried and/or fatty foods. 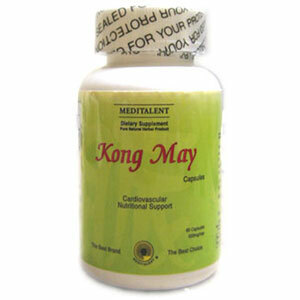 If you are trying to get the effect of a safe, natural herb to decrease your cholesterol, Kong May is your number one choice. Adjust hyperlipidemia, high cholesterol, keep blood vessel elastic. High cholesterol, obesity, stress, high blood pressure, diabetes, for those who drink, smoke, eat fried and/or fatty foods. Adults take 1 to 2 capsules 2 times a day. Once after breakfast and once after dinner.